(Phys.org) —NASA's Cold Atom Laboratory (CAL) mission has succeeded in producing a state of matter known as a Bose-Einstein condensate, a key breakthrough for the instrument leading up to its debut on the International Space Station in late 2016. 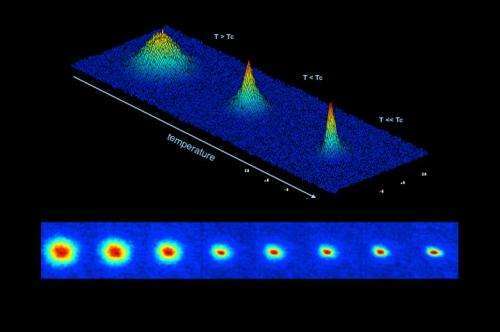 A Bose-Einstein condensate (BEC) is a collection of atoms in a dilute gas that have been lowered to extremely cold temperatures and all occupy the same quantum state, in which all of the atoms have the same energy levels. At a critical temperature, atoms begin to coalesce, overlap and become synchronized like dancers in a chorus line. The resulting condensate is a new state of matter that behaves like a giant—by atomic standards—wave. "It's official. CAL's ground testbed is the coolest spot at NASA's Jet Propulsion Laboratory at 200 nano-Kelvin [200 billionths of 1 Kelvin], "said Cold Atom Laboratory Project Scientist Rob Thompson at JPL in Pasadena, California. "Achieving Bose-Einstein condensation in our prototype hardware is a crucial step for the mission." Although these quantum gases had been created before elsewhere on Earth, the Cold Atom Laboratory will explore the condensates in an entirely new regime: The microgravity environment of the space station. It will enable groundbreaking research in temperatures colder than any found on Earth. CAL will be a facility for studying ultra-cold quantum gases on the space station. In the station's microgravity environment, interaction times and temperatures as low as one picokelvin (one trillionth of one Kelvin, or 293 trillion times below room temperature) should be achievable. 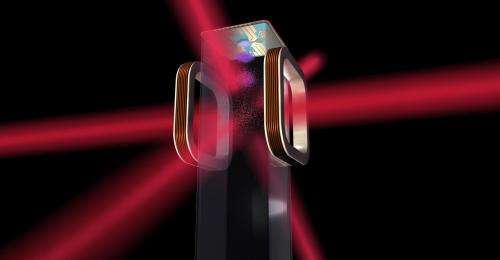 That's colder than anything known in nature, and the experiments with CAL could potentially create the coldest matter ever observed in the universe. These breakthrough temperatures unlock the potential to observe new quantum phenomena and test some of the most fundamental laws of physics. First observed in 1995, Bose-Einstein condensation has been one of the "hottest" topics in physics ever since. The condensates are different from normal gases; they represent a distinct state of matter that starts to form typically below a millionth of a degree above absolute zero, the temperature at which atoms have the least energy and are close to motionless. Familiar concepts of "solid," "liquid" and "gas" no longer apply at such cold temperatures; instead, atoms do bizarre things governed by quantum mechanics, such as behaving as waves and particles at the same time. 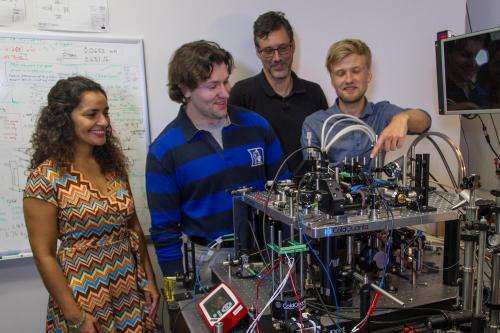 Cold Atom Laboratory researchers used lasers to optically cool rubidium atoms to temperatures almost a million times colder than that of the depths of space. The atoms were then magnetically trapped, and radio waves were used to cool the atoms 100 times lower. The radiofrequency radiation acts like a knife, slicing away the hottest atoms from the trap so that only the coldest remain. The research is at the point where this process can reliably create a Bose-Einstein condensate in just seconds. "This was a tremendous accomplishment for the CAL team. It confirms the fidelity of the instrument system design and provides us a facility to perform science and hardware verifications before we get to the space station," said CAL Project Manager Anita Sengupta of JPL. While so far, the Cold Atom Laboratory researchers have created Bose-Einstein condensates with rubidium atoms, eventually they will also add in potassium. The behavior of two condensates mixing together will be fascinating for physicists to observe, especially in space. Besides merely creating Bose-Einstein condensates, CAL provides a suite of tools to manipulate and probe these quantum gases in a variety of ways. It has a unique role as a facility for the atomic, molecular and optical physics community to study cold atomic physics in microgravity, said David Aveline of JPL, CAL ground testbed lead. "Instead of a state-of-the-art telescope looking outward into the cosmos, CAL will look inward, exploring physics at the atomic scale," Aveline said.